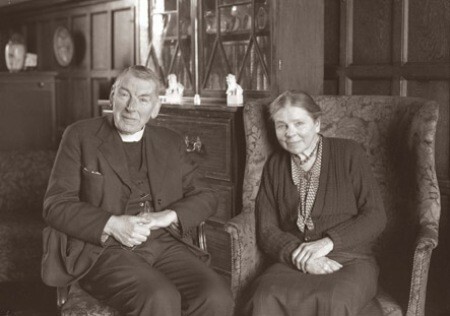 Edmund (E.H.) Fellowes (1870–1951) – pictured here with his wife – was made a Companion of Honour in 1944. Always a meticulous man, he compiled an annotated alphabetical list of all the 220 letters of congratulations he received. It includes almost every well-known contemporary British musician and composer, along with many famous names from other fields, which demonstrates his reputation at the time. He’d already had been given an MVO in 1930, as well as honorary doctorates from Oxford, Cambridge and Trinity College, Dublin. He had conducted a “fantastically successful” nine-week concert tour of Canada, with a choir made up of “the Gentlemen of His Majesty’s Free Chapel of St. George in Windsor Castle and the Choristers of Westminster Abbey” and had returned to make five further three-month-long North American lecture-recital tours (the first at the invitation of President Coolidge’s wife) which ended, in 1936, with his final lute song performance (at the age of 66) being broadcast on the radio from New York. He also toured Holland and Belgium with his lute, and was a very popular public speaker, who had been filling halls throughout the UK since 1904. Although once rather unkindly described as “a stiff-necked Anglican clergyman,” he was also quite a celebrity. A more sympathetic musical portrait of him comes from his younger contemporary Herbert Howells (1892–1983), who characterized him in the second movement – entitled “Fellowes’s Delight” – of his set of piano miniatures Lambert’s Clavichord, published in 1928. Through his researches in libraries, largely at the British Museum and the Bodleian in Oxford, Fellowes rediscovered the lute song, disinterring John Dowland and a host of forgotten English composers in the process, and single-handedly edited the whole repertoire of 450 songs, thereby saving it from oblivion. Here are two jewels that may have not made it, had it not been for Fellowes. ‘Flow my tears’ is now probably the most famous lute song ever. And Fellowes’ editions must have made these songs easily available to composer Benjamin Britten, who used ‘Come, heavy sleep’ and ‘If my complaints’ respectively as bases for sets of variations for guitar (Nocturnal, 1963) and viola and piano (Lachrymae, 1950). Stephen Goss (in this pdf) says that Britten drew his text of ‘Come, heavy sleep’ for Nocturnal from Fellowes’ 1920 edition of Dowland’s First Booke of Songs or Ayres. Fellowes also edited 36 volumes of madrigals, published as The English Madrigal School (later revised by Thurston Dart) and twenty volumes of music by William Byrd. He was one of the four editors (with Alexander Ramsbotham, musicologist-turned-author Sylvia Townsend Warner and her former teacher and married lover, Sir Percy Buck) of the Carnegie Trust’s 10-volume series: Tudor Church Music, which contained works by 24 composers including Thomas Tallis, Orlando Gibbons, Robert White and Hugh Aston. Among Fellowes’ books are The English Madrigal School, English Madrigal Verse (1588–1632) and biographies of William Byrd and Orlando Gibbons. Although superseded by modern scholarship, these books were ground-breaking at the time. His study of Anglican Church music, English Cathedral Music from Edward VI to Edward VII, is still the standard work, apparently. He also contributed more than 50 articles to the third edition of the Grove Dictionary of Music and Musicians. This note on electrification underlines the fact that this record was made more than eighty years ago. I was quite entranced by this piece, when I first heard it as a boy. It was part of a huge stack of 78 rpm records that I found in a cupboard at school. I was given permission to take them home, as 78s had long been obsolete and they were going to be thrown away. See here for more details about this ancient round. More about Fellowes’ editing and conducting next week, with recordings made in the 1920s.